If you’ve been looking for an affordable new convertible that can give you the performance you need and the stylish looks you desire, you’ve just found it. 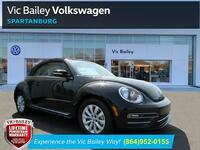 The 2019 Volkswagen Beetle Convertible in Spartanburg, SC gives you the iconic look of the Beetle that is recognized all over the world and the company’s most innovative new features and options. The 2019 Volkswagen Beetle Convertible offers the top-down driving experience you’ve been searching for. With four available trim levels to choose from, you’ll have an easy time getting all the technology features and comfort options you’ve always wanted when choosing the 2019 VW Beetle Convertible. The four available trim levels in the 2019 Volkswagen Beetle Convertible lineup include the S, Final Edition SE, Final Edition SEL, and SE. The auto industry has come a long way in terms of automotive technology, comfort and safety, and Volkswagen is leading the way. If you want to get behind the wheel of the most innovative new convertible there is, the 2019 Volkswagen Beetle Convertible in Spartanburg, SC is the top choice. With its long list of features and options to choose from in its many different trim levels, you’ll have no problem getting all the technology and comfort you desire when buying a new 2019 Volkswagen Beetle Convertible. The impressive list of standard features and available options includes driver and passenger favorites like VW’s Climatronic® dual-automatic climate control, a leather-wrapped steering wheel with controls, keyless entry, push-button start, ambient interior lighting, leather seats, heated front seats, VW Car-Net® App-Connect, Bluetooth® audio streaming, a rear view camera, USB port, touchscreen infotainment system with navigation, SiriusXM®, Fender® audio system, and much more.